In May, Columbia University students were up in arms after a list of alleged rapists attending the college kept popping up on the walls of a campus bathroom. It appears that now, a similar (if slightly more technologically advanced) tactic is being taken at the University of Chicago. 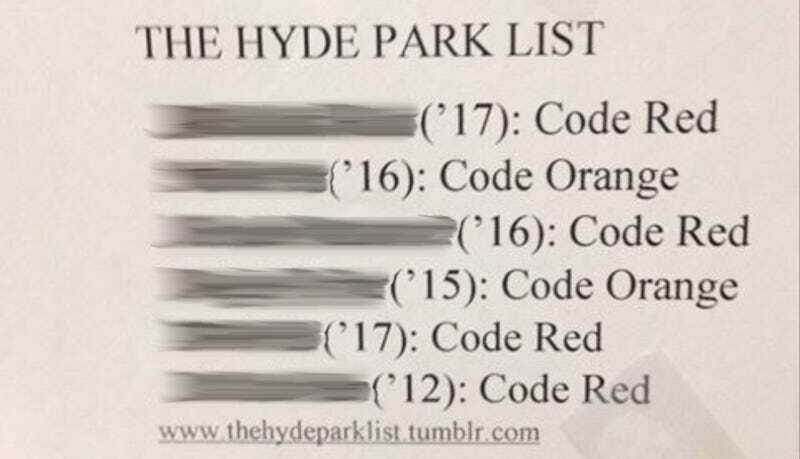 Multiple UChicago students emailed Jezebel about a now-defunct Tumblr called The Hyde Park List (the University is located in the Hyde Park neighborhood of Chicago) which seems to have been taken down as quickly as it started (the first post looks like it was put up this weekend, but by Sunday evening, the Tumblr was gone). According to an email sent from concerneduchicagostudents@gmail.com to Jezebel, the Tumblr "lists students who have sexually harassed and/or sexually assaulted peers," though an email sent to the address made available on the Tumblr requesting comment has not received a response. First years just arrived on campus for Orientation Week, though the school year has not yet officially begun. But flyers about the Tumblr are still circulating. Those flyers list the names of six current and former UChicago students; all appear to be men and do/did go to the college. After each name, the person is given a color – "Code Orange" or "Code Red." According to a cached version of the Tumblr, it was started by a group of "Concerned Citizens" who are "Keeping the community safe—since the University won't." The names listed on the Tumblr don't appear to have any further information attached to them than the accused's name, class year, "Code Orange" or "Code Red," though at least one includes this message: "Note: Often at fraternity parties." OBJECTIVE: Keeping the Hyde Park community safe from people known to commit varying levels of gender-based violence—since the University won't. COLOR-CODING: Two-tiered system. Red is for the most severe offenders, followed by orange. SUBMISSIONS: Provide a name (current student or otherwise). Give context to help in color-coding or flesh out things we've heard elsewhere. Though most University of Chicago students are still on summer break, Rasmussen said that student government leaders and others already have expressed enthusiasm for the campaign, and she expects to see activity grow as students return to campus in coming weeks. "Sexual violence concerns us all deeply, and the University has fostered a particular commitment to addressing sexual misconduct and unlawful harassment and discrimination—that is essential to sustaining an academic community in which all can participate freely and fully," Rasmussen said. Update: A University spokesman says the college has "no comment" about the list but reiterated their "commitment to preventing and addressing sexual misconduct, unlawful harassment, and discrimination, which is essential to sustaining an academic community in which all can participate fully and freely" as outlined in their Friday press release.